Synopsis: Sam is a typical twelve-year-old boy who works on his parent’s farm, but is not as interested in horses as his horse-training family. However, he does his best to help out until an incident when he is riding with his mother. 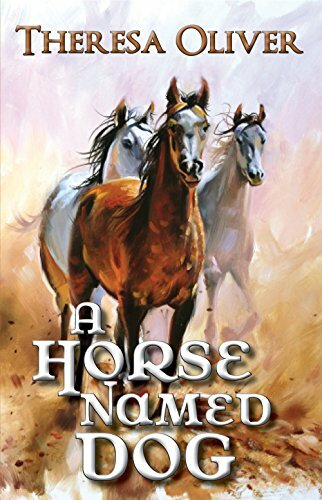 After saving her from becoming nearly trampled, his viewpoint changes … until a strange horse comes to their farm with quirks, earning him the name Dog. "Theresa Oliver’s young people’s novel, A Horse Named Dog, is a compassionate story about connections: between boy and horse, boy and parents, boy and the world around him. It also addresses concerns about dealing with problems and overcoming fears, no matter how justifiable these fears might be. Sam connects with the horse named Dog. Sam has a positive connection with both of his parents, although he does challenge his dad’s insistence that Sam helps with the horse training after his mother’s accident that leaves her laid up for some time. Sam is also capable of expressing his opinions, both to his parents and to mean horse trainers who try to take Dog away from him. But the most compassionate connection is between the boy and the horse. This is a touching story of a boy and the horse that brought a family together . When Sam and his mom decided to go for a ride , who knew that the day would go the way it did . After his mother gets bucked off and trampled by a horse . Sam has to find his courage to get his mom away from the horse and home . He is the hero that gets his mom home but in the process he gets hurt also . Now he is scared of horses and wants nothing to do with them . Until the day dog shows up on the farm to be trained, they bond and help heal each other . He saves dog a few times through out the book and the bond grows stronger. He starts to trust again and help his family out . The characters in this story are sweet and you will fall in love with dog . He is the kind of horse that will fall in love with you and do anything you ask . He is a sweet horse that will steal your heart . Sam is a sweet kid who in the face of danger steps up and becomes the man that his mom needs . He is also still a kid that is shouldering a lot of pain after what happened on the ride. He is also scared and trying to act tough . He really does grow up as you read the story . He becomes a great horseman and a great trainer . I really enjoyed this story even though it was written for middle school kids. I am a horse girl so any story with a horse in it I will read. The story is enjoyable and you will get a kick out of dog . There are just a few things that had me just a little off a couple of spelling errors but you will probably read right over them . Also the actions of dog kind of had me baffled for a bit. Over all I loved the story it shows us that animals understand us more then we realize . They are a comfort to be with in bad times and good times . So this is a story for your kids this winter . Check it out .